We’re revamping achievement levels: Crowns are out and Achievements are in! Starting soon, when you send and receive gifts, stickers, and more from the Paltalk Virtual Gift Store, you earn Experience Points (‘XP’, replacing Crown Points) to help you progress to higher and higher Achievement Levels (replacing Crown Levels). Easier to read and understand for all our members, Achievement Levels are coded by number, icon, and color on a scale from 1 to 130 to better highlight your accomplishments. That’s right. 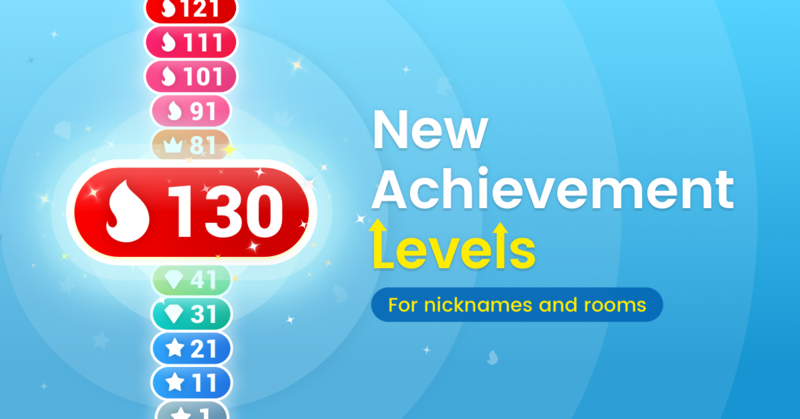 There are now one hundred and thirty unique Levels you can achieve! Nothing has changed in the way you earn points. As before, when Member A sends a gift to Member B, Member A receives XP equal to half the gift’s Credit value. Member B receives XP equal to the gift’s Credit value. If Member A gifts herself, she receives XP equal to the gift’s Credit value. Send Gifts to your Pals and encourage them to send gifts back to help boost your ranking. Check the Leaderboards to measure your progress. New with this change, both rooms and nicknames use the same XP scale to reach any specific Achievement Level, so it’s easier to keep track of where you’re at and what you need to keep climbing. Plus, every ten Levels you get a sweet little bonus prize of free Credits, starting with Level 1. It’s easier than ever to get started and make your way up the ranks. Your current Crown/Crown Point total equates to a new Achievement Level and marker. We will automatically award you the Achievement Level equal to your current Crown. For example, if you have 5000 points, you are a Level 2 Crown and receive Level 11 in the new system. Can anybody say, “Upgrade”? Your XP will expire at the same time as the Crown Points they replaced. If you had 100 Crown Points set before the switch to expire in 14 days, they will still expire in 14 days after the switch to Experience Points. The same applies for guaranteed Crowns. If you had a Level 8 Crown (formerly guaranteed for 120 days upon earning) that will expire in 78 days, you are guaranteed the equivalent Achievement Level for the remaining 78 days. Newly earned high Achievement Levels no longer come with guaranteed timeframes after the switch. You won’t earn bonus Credits if your Level increases because of the move, but you can still earn them when you hit the next qualifying Achievement Level. Those are the basics, Pals. We hope you like the new, easy to understand Achievement Levels, which help you and your Pals maximize your prestige and show off your experience. If you have any further questions, please contact our Help Desk at support.paltalk.com and our team will be happy to assist you. We'll be sure to let you know when the change goes live. Until then, happy achieving!